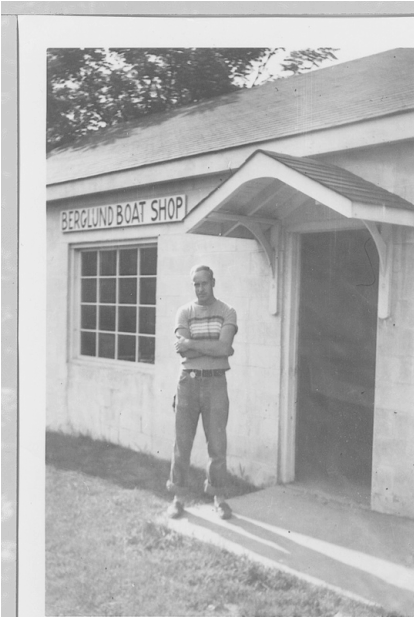 Berglund Boat Company began when Bob Berglund returned from serving as a Marine stationed in Beaufort, North Carolina. It was there while he was on leave that he had the opportunity to watch boatbuilding in a seaport shop. He learned all the design principles of both power boats and sail boats. He combined his boat building knowledge while incorporating ideas he developed through constructing model airplanes as a youngster and began designing. "Aerodynamics is the key to boat design. just like with an airplane". His ambition to turn his hobby and enter the occupation of boat building became a reality after his discharge in 1946. He returned to his hometown of Lockport, Illinois and built his first boat in his mother's basement. He began building wood eight foot prams and his boat business began to grow. He gained recognition throughout Illinois and surrounding states for his craftmanship and inherit perfectionism. The following year he moved his operation to a 24 X 36 building at the same residence. His readymade boats were 10' car top models and 12' row boats and runabouts. The boats were constructed of Philippine mahogany with oak keels and fir plywod bottoms, transoms and seats. Approximately 68 power boats and three sail boats were built in this location. In 1950 he was the only full time boat builder in Will County and noted as "Noah's competitor". Photo taken inside the shop in Lockport. 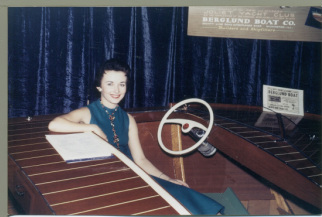 A model poses in a Berglund Boat at the 1954 Chicago Boat Show. 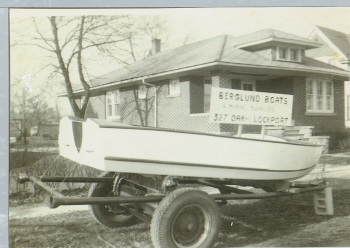 In 1951, The Berglund Boat Company was invited to move to a larger shop at the Joliet Yacht Club on the Des Plaines river. At that time he employed two helpers and completed about three boats a week. Many customers requested that they wanted to purchase a boat that he personally built long after additional workers were hired. He exhibited his sleek wooden boats at the Chicago Boat Shows and again drawing a larger interest and the business grew. Although he built power boats, he was quoted as saying "I always built power boats, but my real love was sailing". He built a 24' auxiliary sloop in 1952 with intentions to take a trip around the east coast but ended up selling it so he could continue to grow the business. With the popularity of Berglund Boats and seeking capital for expansion purposes, Bob went into partnership with Hugh Black and they constructed an even larger shop at the Three Rivers Yacht Club. Hence, the beginning of Berglund & Black. 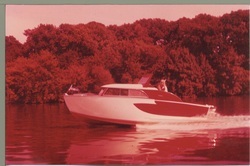 It was at this time when a new two-toned lap design was adopted which gave the boats thereafter, a unique and recognizable appearance. It was during this partnership of Berglund & Black a vast majority of boats were produced. The expansion allowed up to ten boats to be built a day with thirty-two employees. Two basic models a 14' & 16' outboard runabout were the most common. There were many models to choose from. The Sportslancer, The Sportsflyte, The Sporstsflyer, The SportsSkier, and The SportsNiter, all available with custom accessories. Most were constructed with a walk-thru feature for easy, safe movement to the rear cockpit. The deep "V" design gave these boats a fast, smooth ride, ideal for water skiing. You can plane and be skimming over the water in seconds. They were designed for the "non-pounding" ride. The largest model built on a regular basis was The SportsCruiser Ambassador. A 20' cabin cruiser. Boat dealers were set up in many states including Colorado, Minnesota and several on the east coast. 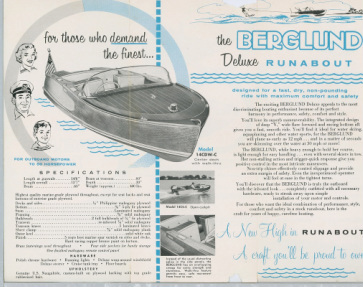 Berglund & Black produced boats until 1959. The original buildings are still on the site today. Close to 3,000 boats were produced in total. As the interest in fiberglass and aluminum boats began to take hold, rather than switch from the wood boats he loved, he decided to leave the business. He spent the rest of his career repairing and remodeling large wooden cabin cruisers at Three Rivers Yacht Club in Wilmington,Illinois. Many articles on Berglund Boats were published over the years. During one of these interviews, he was quoted "Seeing one of my boats, and seeing that someone thought enough of it to take care of it, really makes me feel good", he said with a grin.